Check out all the best of the week in Issue 126 of the Tech Smart Boss Newsletter. As a Tech Smart Boss we spend a lot of time on the Internet. Whether it’s searching for new apps, looking at design inspiration, or just relaxing and wasting time, we consume a lot of information (and webpages). This week’s Cool Tech of the Week can give us the super power of photographic memory, History Search. 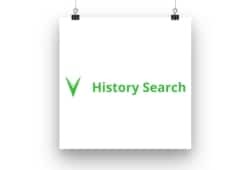 History Search is a browser extension that works on all your major browsers and captures all the places you go on the Internet (except the ones you exclude). Then you can quickly search by a variety of ways and it will bring that page you vaguely remember right back to your fingertips. It’s a lot better than just a folder of bookmarks as you can search terms on-page and it’s not just limited to what Google knows. Plus they let you create collections (kinda like a folder of bookmarks), where you can just right-click on-page and store in a collection for future review. Check it out, they have a free plan you can get started with. History Search, our Cool Tech of the Week.